Dream catchers are one of the most fascinating traditions of Native Americans. The traditional dream catcher was intended to protect the sleeping individual from negative dreams, while letting positive dreams through. The positive dreams would slip through the hole in the center of the dream catcher, and glide down the feathers to the sleeping person below. The negative dreams would get caught up in the web, and expire when the first rays of the sun struck them. A dreamcatcher changes a person's dreams.Nightmares pass through the holes and out of the window. The good dreams are trapped in the web, and then slide down the feathers to the sleeping person. 100% HANDMADE.Each one is unique in the world.No two are exactly the same,so,maybe alittle different from the picture,hope can understand. 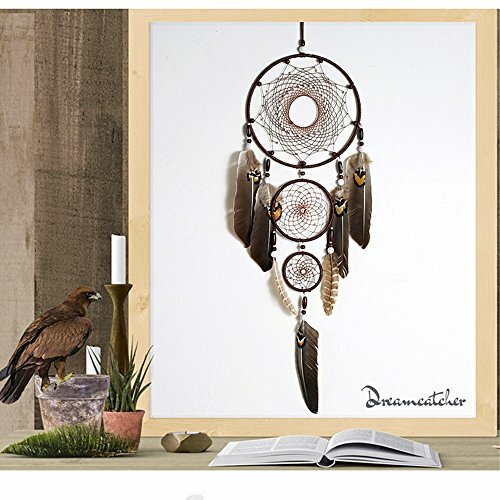 View More In Dream Catchers. If you have any questions about this product by Karleksliv, contact us by completing and submitting the form below. If you are looking for a specif part number, please include it with your message.